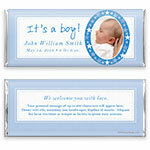 Introduce your newest arrival to the world with this bright and cheery photo wrapper featuring stars in an oval frame. Design: Oval photo frame with star accents. Personalization: Front message, name and date with back title and message. Recommended Photo Size: 383 W x 507 H pixels.